SANTA CLARITA, Calif. (June 21, 2016) – Princess Cruises today announced a thirst-quenching deal with the Sip & Sail cruise promotion offering free all-inclusive beverages, plus an early booking bonus offer of free specialty dining for bookings made before July 5, 2016. More than 350 cruise vacations for Summer 2017 to Spring 2018 are on sale to destinations around the globe. In addition to great fares, Sip & Sail includes unprecedented offers to sweeten the deal. Guests booking a balcony, mini-suite or suite staterooms will receive a free All-Inclusive Beverage Package for two people. Plus, reduced fares as well as free Unlimited Soda & More Packages for third and fourth guests. The All-Inclusive Beverage Package includes any individual beverage item such as soda, juices, shakes and floats, bottled water, cocktails, spirits, wines, beers, specialty coffees and tea, up to $10 retail value, purchased at all bars, public lounges and dining venues. Additionally, full bottles of wine below $100 retail can be purchased in the bars, dining room or in stateroom at 40% discount from the menu price. Guests can also book and receive these offers with a special reduced deposit of only $100 per person for first through fourth guests in a stateroom. More information about the Sip & Sail cruise sale is available at princess.com/cruisedeals. All prices are per person based on double occupancy. The “Sip & Sail” cruise deal runs from 12:00 a.m. PDT on June 21 through 11:59 p.m. PDT on August 31, 2016 and is available to residents of the United States, Canada, Puerto Rico, Mexico and Bermuda. One of the best-known names in cruising, Princess Cruises is a global cruise line and tour company operating a fleet of 17 modern cruise ships renowned for their innovative design and wide array of choices in dining, entertainment and amenities, all provided with the experience of exceptional customer service. 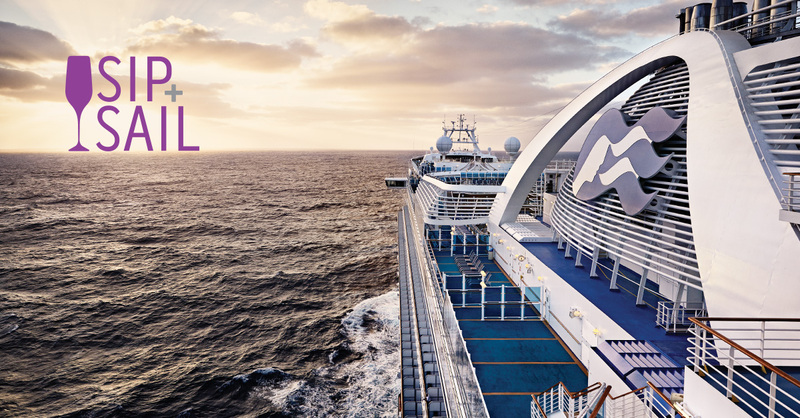 A recognized leader in worldwide cruising, Princess carries 1.7 million guests each year to more than 360 destinations around the globe on more than 150 itineraries ranging in length from three to 111 days. The company is part of Carnival Corporation & plc (NYSE/LSE: CCL; NYSE:CUK).